There is cold and there is cold. I am not speaking of Pluto but of my birth state of Minnesota. It was 15 to 20 degrees BELOW zero not including the wind chill that put it into the minus 35 to 40 range. But being with the trombone section, and the orchestra in general, was a very warm, human experience. It was great to play in the trombone section. It was totally easy, in every way, and it sounded beautiful. Doug Wright and I (in photo) played together as if we had never stopped 12 years ago. Playing with Dave Herring and Steve Campbell felt the same way. I also had a great time with my brother and sister who live in the Twin Cities. Their love and concern for my well being was so touching. I also was fortunate to see a production put on by the "Out on a Limb" Dance Company and School. My sister, Marcey, is the vice president and her two sons, David and Jeremy Bensussan, my nephews, basically have danced their whole lives in it. They were great in the performance of "Willie Wonka and the Chocolate Factory." It was on Valentine's Day that I went to an old favorite candy shop in Minneapolis called Candyland, where they have the best caramel popcorn I ever tasted. It brought back memories of when my mother used to take my sister, brother and me there when we were children. The only problem that day was that my valentine, Carol, was in Boston!! I will look forward to my next trip to play with the Minnesota Orchestra in April. At that time, I hope to see my former teacher, Ronald Ricketts. He was out of town last week. Then we can take another "three' generations" photo. A big "Bravo and thank you!" to the PAT participants today. I am very happy and filled with gratitude that there are those who wish to experiment with me in this way. It was also nice to hear from a couple of you so soon who played in today's concert. For me, it was fascinatingly wonderful. I played what I was feeling. Eventually, I started playing a very short sequence of notes that sounded like prelude music for ... PAT concerts. I will be sharing it with you shortly on the blog. When the music came, I was feeling very open, secure and very aware that others were playing alone, knowing they were not alone. People from different parts of the planet. WOW! I felt very happy, simple and childlike during the applause at the end. What a unique sensation and sentiment to clap for others in appreciation, knowing others were doing the same! Here I was in a room with just me, but I knew I wasn't. Carol was participating in another part of the house and, afterwards, when we spoke about it, she expressed a feeling of simple gratitude that it could happen and that everyone could succeed in such an unpressured way. 1. Do whatever you do to get ready to play your music. 2. Be comfortable and natural. 3. For those that feel comfortable with trying something new, acknowledge, in your own way and style, that there are others, in their own special musical world, supporting your love and privacy in this experimental concert. 4. Connect to your love, joy and gratitude that your life allows you to be able to have your own private musical life. 5. Start playing when you feel you are ready to play. The concert will begin at 4:00 PM Boston time and end at 4:30 PM. If you feel inclined to play 'encores,' please do! Even if you do continue you to play after 4:30, at 4:30 if you can give a soft applause to yourself and all those who participated in the concert. If you feel so inclined, I would love to hear from those who participated by leaving a brief comment on the blog. This Sunday, I will be leaving for Minnesota, the state of my birth and upbringing. A place where there has been three generations of my family born. Also, a place where the local world famous Minnesota Orchestra has a very interesting 'three generations' story of its own in the trombone section. 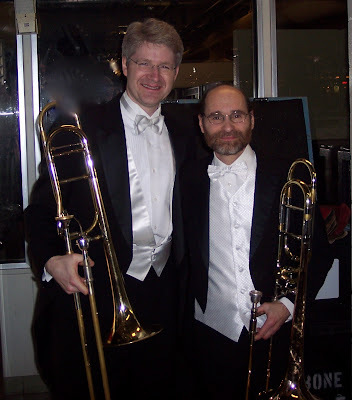 Next Week, I will be playing 2nd trombone to my former student, Douglas Wright, who is the Principal Trombonist of the Minnesota Orchestra. Doug is a truly marvelous trombonist and musician of the highest caliber. It will be a joy playing next to him and the great bass trombone player, David Herring. I also know their terrific tubist, Steve Campbell, very well. He was in Boston as a student and a freelancer. It will be an honor to play with them again. The 'three generations' connection is this: Doug replaced my former teacher, Steven Zellmer. That means he is, in a certain way of thinking about it, a 'grandstudent' of Steven Zellmer. I will be playing in the seat of Kari Sundstrom, who is on sabbatical and replaced another teacher of mine, Ronald Ricketts. I have played with the Minnesota Orchestra before but on euphonium. I have never played trombone in the orchestra, the first orchestra I ever heard when it was the famous Minneapolis Symphony. This will certainly be a most memorable 'family' event of the 'third' kind! The place: Wherever you are! Now, we have a concert date! This is going to be our first time ever Playing Alone Together concert. I am really excited about this experimental concert. It will be very curious to see and experience what can happen in this unique situation. For those that are interested in participating, mark your calendars with the above timings and check back for special, easy-to-follow instructions. These instructions will help facilitate our concert and will be posted within the next week. So stay tuned! In the meantime, I will leave you with a quote from one of my most important first teachers, who was my Grandma Leah: "Make beautiful music."